Contoured to the natural shape of the mouth, this mouthpiece can be held gently, but securely – eliminating the need to clamp down or the possibility of "popping" out of the patient's mouth and interrupting the study. The soft plastic material is transparent so that any obstruction can be immediately detected by the technologist. 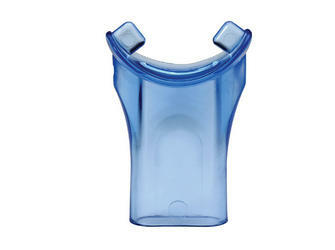 Pleasantly scented with vanilla, this mouthpiece makes the procedure a little more comfortable for the patient. *NOTE: Each mouthpiece is sold in multiples of 25.